Poke Ball Plus review: "A must-buy for Pokemon fans"
As someone who's about to crest 30, I have an inordinate amount of what my boyfriend would call Pokemon tat, but I would call high class merchandise. From amiibo to plushies, stationary to Pikachu-themed bento boxes, I've pretty much got it all. But what I didn't realise that the thing that was really missing from my collection is this - the Poke Ball Plus. Arriving alongside the glorious Pokemon Let's Go, it's a dedicated Pokemon catching peripheral, and possibly the stuff dreams are made of. Part of the premise of Pokemon Let's Go is that you can play it one-handed with a single Joy-Con, but if you purchase the special bundle of Let's Go Pikachu or Eevee for £89.99 / $99.99 you get this wondrous little gadget packaged in too, which you can use to play the game instead. And oh, what a delight it is. It's not often that I get something out of a box and literally squeal with glee, but that's exactly what happened with the Poke Ball Plus. It's somewhere around the size of a ping pong ball, and even with my giant man hands, it's small form factor fits perfectly in a throwing claw, just as I imagined a real Poke Ball would have watching the anime series growing up. In the centre, where the button for the ball would be normally, is a little analogue stick, which you can use to propel your player around the screen, select options and do everything a normal joystick would do. Clicking the stick in acts as your A button, while a button built into the top of the red part of the Poke Ball Plus is your B button. It takes a while to figure out, but if you shaking the ball acts as a Y button. Of course, you don't have any other buttons than that, so if you need to take a screenshot, go back to the home screen or any other functionalities for that matter, you're going to struggle. I ended up keeping a Joy-Con by my side when playing on the TV just in case I needed anything else. But to be honest, when you're fully immersed in Pokemon Let's Go recreation of the Kanto region, you're going to forget that you don't have an X button on your Poke Ball Plus. You've got everything you need at the touch of a Ball, and playing with a real Poke Ball is everything my inner child imagined it would be. Faux throwing your Poke Ball Plus to catch Pokemon is a delight, and using it to move your in-game hand to give Pikachu a belly-rub is surprisingly responsive experience. Plus, it's coated with a incredibly soft matt finish, which makes playing Let's Go with the Poke Ball Plus a tactile joy. It does mean that the white section does get incredibly grey rather quickly, with that kind of grubby sheen that only comes clean with a wet wipe. That's especially true if you're shoving it into a pocket for a Pokemon Go catching session, more on which in a bit. But grubby undersides aside, the nostalgic thrill actually goes much, much deeper than just the feel of a ball in your hand as you play (and yes, everything I try to write in this review is an accidental innuendo). Wonderfully, when you catch a Pokemon the area behind the joystick lights up, mimicking the in-game animations, and it even makes the 8-bit cries of the original Pokemon Yellow game when you catch them. There's a surprising amount of tech packed into this small package, which makes it a seriously impressive bit of kit, but also adds a good weight to it, which adds to the satisfaction of using it. For anyone who played the original back in 1998, using a Poke Ball Plus brings all your childhood memories back more than I ever thought a mere controller could. I've never experienced so much joy from a peripheral before. Of course, for Pokemon Go players, the Poke Ball Plus has another intrigue, because it can double up as a Pokemon Go Plus. Simply sync it with your phone from the Pokemon Go settings menu and you'll be able to catch Pokemon and spin PokeStops simply by hitting the B button on the Plus, without having to even look at your phone. It works incredibly well, especially if you're someone like me who's switching between Pokemon Go and Pokemon Let's Go at regular intervals. There's obviously an added bonus for anyone who buys the Poke Ball Plus because there happens to be a Mew trapped inside. You couldn't catch Mew in Pokemon Yellow and I don't think there's any other way to get the Mythical beast in-game in Pokemon Let's Go either. The Poke Ball Plus is a fantastic little controller that has a surprisingly wide variety of uses within the Pokemon universe. 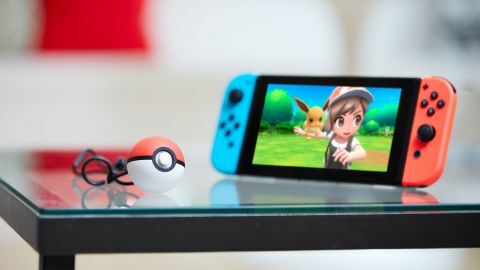 It's a must-buy for Pokemon fans keen to feel even more connected to Pokemon Go, and if you're dual wielding Pokemon Go and Let's Go, it gets even more useful. If you have any interest in the Pokemon Universe, you deserve to own this excellent piece of kit.